Seeing how the first major snowy forecast is being called for tonight, right in between the fall equinox and winter solstice on the calendar, a fundraiser scheduled for tomorrow was unexpectedly planned perfectly. The Spirit of Faith Church has been serving food to people in the Jacksonville area and many in the surrounding community for over a quarter century through the Spirit of Faith Soup Kitchen. According to Spirit of Faith Pastor Polly Pulley, the years have taken a particular toll on a vital aspect of the Kitchen: the building's roof. Pastor Pulley joined WLDS' What's on Your Mind Program recently to discuss a great way to allow the community to gather and get some warmth and nutrition after the snowfall tonight. 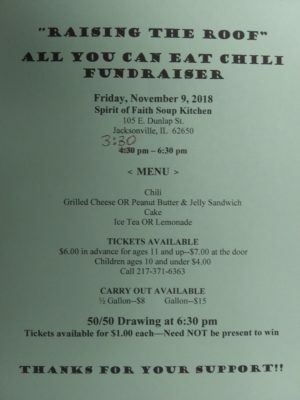 The “Raising the Roof” All-You-Can-Eat Chili Fundraiser will be tomorrow afternoon at Spirit of Faith Soup Kitchen, located at 105 East Dunlap Street off North Main, just north of the railroad tracks. There is limited parking in the church's lot along main street, but there is a second, larger parking lot on the opposite side of the church between Main and East Streets. Pastor Pulley describes the necessity that caused her and her team to have this idea. "We were told by our insurance company that we need a new roof, and we are trying to raise $46,000 to complete this project. The winter season is unfortunately upon us, so the current plan is to begin putting the new roof on the kitchen in the spring. Pastor Pulley explains the food options to be offered Friday. "The entire menu will be: chili, choice of one sandwich [PBJ or Grilled Cheese], cake, and water/tea/lemonade. Carry out will be available throughout the day tomorrow as well for our chili. 8 dollars buys half a gallon of chili, and 15 dollars can buy a whole gallon of chili." 50/50 Drawing tickets will cost only one dollar per ticket. Bringing your own tupperware or other heat resistant plastic container or containers to collect any carry out chili you may wish to purchase tomorrow is recommended, as the Church may have zero or only a few containers which they can give away. Pastor Pulley says the church has made an account dedicated to the fundraiser locally. "Go to Jacksonville Savings Bank. We have set up a specific account just for the roof, and if you go to Jacksonville Savings Bank and ask to add to the Spirit of Faith Kitchen Roof building fund, they will absolutely do that. No questions asked, and this is a great way for donors to remain anonymous if they would like to do so." The fundraiser will begin tomorrow with doors opening at 3:30 p.m. Scheduled end time for the all-you-can-eat fundraiser is 6:30. You can call Pastor Pulley to reserve a ticket Thursday at (217)371-6363, and a ticket will cost 6 dollars. One meal ticket will be 7 dollars at the door tomorrow. Plates for children 10 and under cost 4 dollars.